Before we get started I have to say I’ve eaten at DeFazio’s probably a hundred times. I mostly get the same things: sausage cannelloni (similar to manicotti, only it’s a cheese sauce instead of marinara). YUM. DeFazio’s has delicious sausage. If you like sausage, get something with sausage in it. I also LOVE their deluxe pizza. 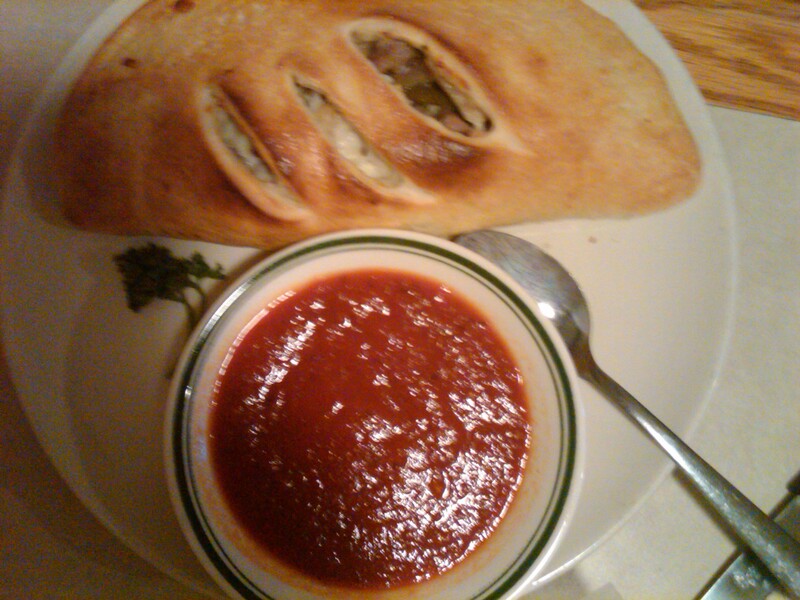 And their calzones are to die for, specifically the one with sausage, peppers and onions. I’ve also done their chicken breast with a side of pasta (I normally choose spaghetti). 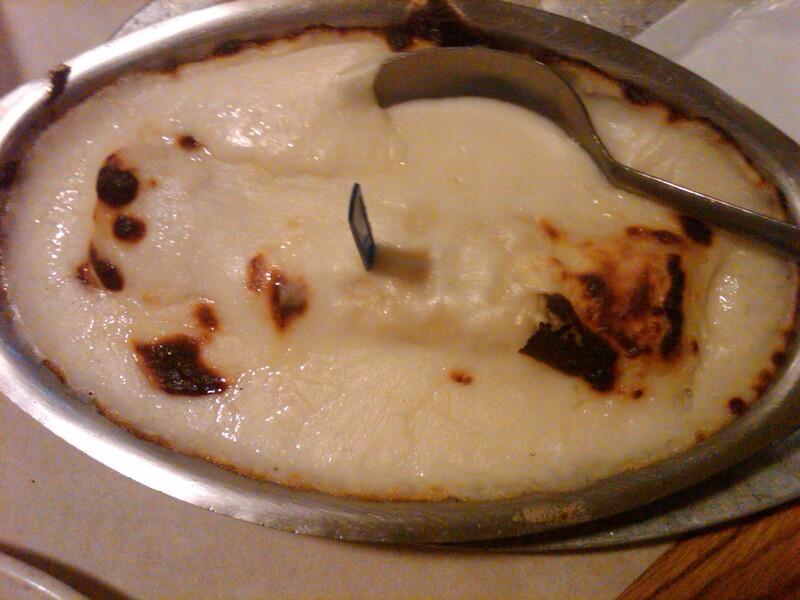 Their four cheese lasagna is VERRRY cheesy, so proceed with caution. And their farfalle pollo is yummy, too (I always have them leave out the peas). My mom and sisters swear their fettuccine alfredo is the best in the world, and Kristy always gets it with a side of mushrooms. I know they offer two options for mushrooms, and think she chooses the ones sautéed in marinara sauce. But speak up if I’m wrong. And never, never, never go to DeFazio’s without getting their Italian salad. In fact, if you’re craving a salad, get a big one and a side of garlic bread. You won’t be disappointed. I recommend crunching up some of the whole wheat crackers they bring with the salad and putting them right on top. Hey, like I said, I like carbs. But in this case, the extra crunch of the crackers makes the salad. And, finally, if you’re not stuffed to the brim (I usually am), go for a cream puff. Alright, I know all of you Sweet Basil fans out there are crying foul. Saying it’s not fair to try one dish at Sweet Basil and try to compare it to years of making sweet, sweet love to DeFazio’s, my first and onliest. But don’t worry, fair readers. I’m a food whore. I get around. And I don’t think about my other lovers when I’m with another. And I HAVE had Sweet Basil more than once. My very first experience with them was for my friends’ (Jess and Dave) rehearsal dinner. All I remember is digging into the most delicious lasagna I’d ever eaten. I dreamed dirty dreams about that lasagna. And I’ve had Sweet Basil several times, catered at work. But here’s the problem: I never think catering is as good as a single dish or a small family style meal (like the rehearsal dinner). So when I had Sweet Basil catered at work, I was disappointed. The way to go, my friends, is ordering a small portion, in the restaurant. Not from the buffet. Not catered. No offense, Sweet Basil, this is true of all restaurants. So what did I get? Well, first, their Italian salad rivals DeFazio’s. They don’t have the pickled eggplant like DeFazio’s (which makes DeFazio’s salad), but their salads have mozzarella, banana peppers, and pepperonis. Yes, pepperonis. Genius! It’s hard to say which one was better. They were both so good. These Italian salads are made by the homemade dressing. I’m about to marry into the family just to get the secret recipe. Any takers? I could be Kelly DeFazio. Or Kelly… Sweet Basil? 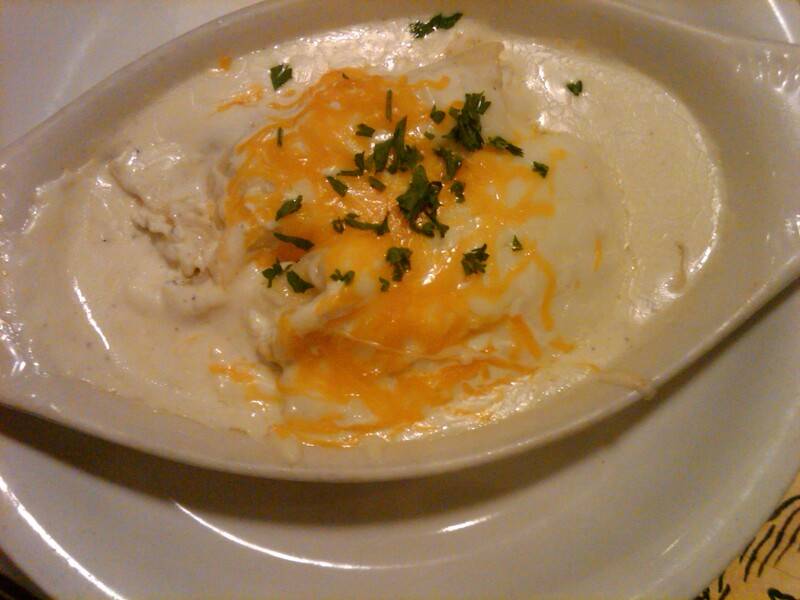 After perusing the menu for what felt like hours, and ordering a glass of wine, I finally settled on the cheese manicotti, which is smothered in alfredo sauce. Sounds cheesy, right? Yup, right up my alley. I teetered back and forth on the edge of lasagna considering my past “oh” moment with the stuff, but finally decided I was probably simply really hungry at the rehearsal dinner. And eating out of nerves. I had to read a reading at their wedding, and it’s fair to say I was having a public speaking-related nervous breakdown. If I was that way the night before, imagine me the day of the wedding! Anyway, I ordered with trepidation, because that’s what I do. I almost broke down and got the buffet. But ultimately stuck to my guns. And was pleased when Kaitlin, my lunch date, ordered lasagna. The verdict? My cheese manicotti was just OK. It was exactly as described, but I found myself wishing it had something else. I’m not sure what? Maybe I was longing for sausage (and comparing it to DeFazio’s sausage cannelloni)? Or maybe I needed a side of marinara? Regardless, I ate it. And it was pretty good. What I DID have, though, was a bite of Kaitlin’s lasagna. And let me tell you what, DELICIOUS! I’m not sure what it is about their lasagna, but it’s the best I’ve ever had. 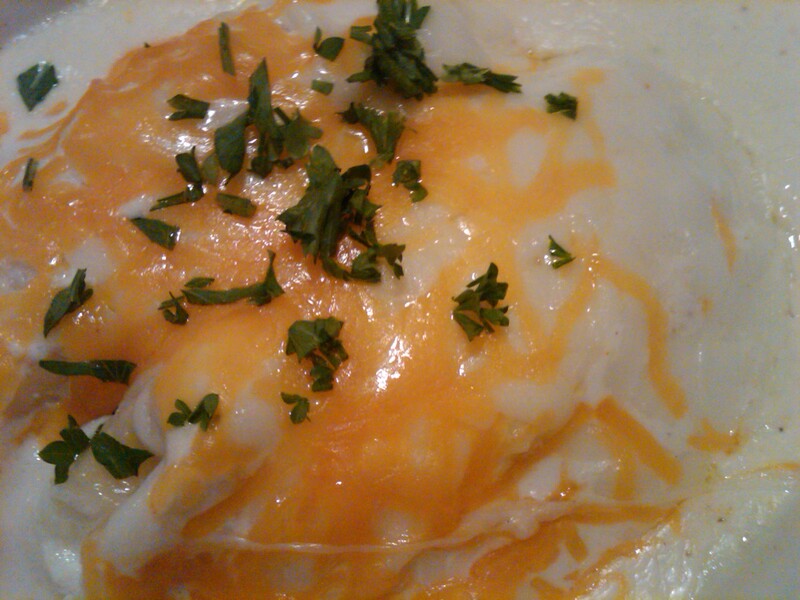 A few other dishes I mulled over and might order next time: Manicotti with ground meat or chicken (maybe they’d do the cheese sauce on top, and a side of marinara? ), and the eggplant parmesan. All-in-all, if I were standing dead center between the two restaurants, I can’t lie, I would choose DeFazio’s. But Sweet Basil is a very tough contender. I’d definitely eat there regularly, too. Next time, I’m definitely getting the lasagna. And relishing every delicious bite. Any of you loyal Sweet Basilers, holler out your favorite dishes so I know what else to try! 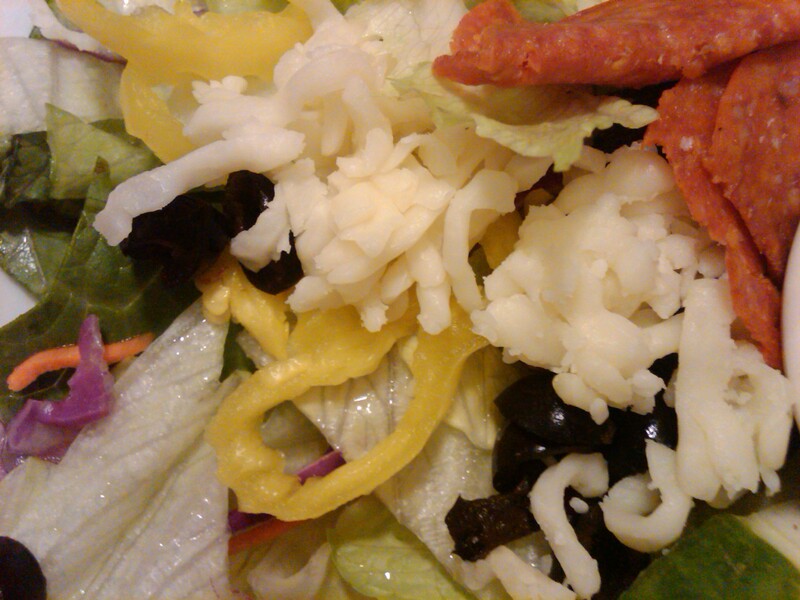 Close-up of Defazio’s Italian salad. See the pickled eggplant? It makes the salad. But there are also tomatoes, green and black olives, and peppers. By contrast, Sweet Basil’s salad which has cheese and pepperonis instead of the pickled eggplant. Both have delicious dressing. 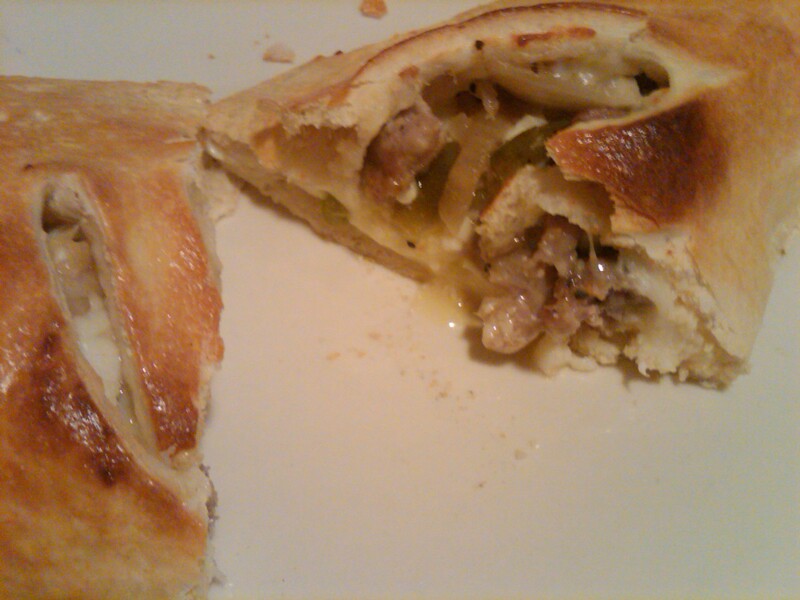 Kim’s sausage with peppers and onions calzone. It comes with a side of sauce for dipping. The crust on the calzones is chewy and a little crunchy. And the inside filled with cheese, their awesome sausage, onions and peppers. Scrumptious. 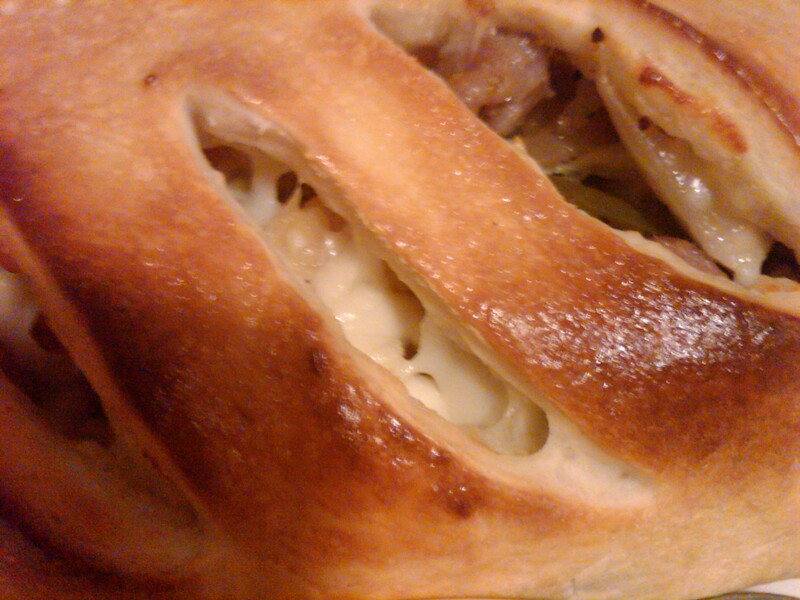 Close-up of the calzone. Who thinks I can make these? Yeah, I don’t think I can, either. And, finally, the inside. Gooey deliciousness. Here’s my cheese cannelloni. I love the crunchy browned cheese on top. I always top with parmesan cheese and red pepper flakes. And sometimes I’ll steal a spoonful of my sisters’ calzone dipping sauce. I somehow forgot to take a picture of their garlic bread. But it’s these thick, buttery, garlicky, slices of chewy/crunchy bread. I dream about that stuff. Especially dipped in the cannelloni cheese sauce! Here’s the cheese manicotti from Sweet Basil. Normally I like all cheeses, but wasn’t a huge fan of the cheddar cheese on top. 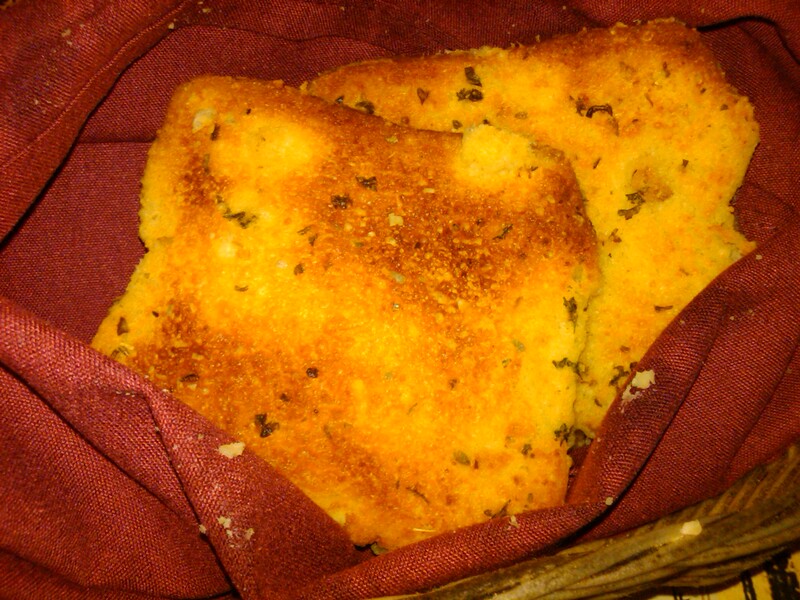 And Sweet Basil’s garlic bread. They bring it both with the salads, and refill it when you get your meal. DeFazio’s brings two pieces of bread per entree ordered (which doesn’t include items like pizza or calzones). I’d like to take this opportunity to extend a gigantic “RIP” to Angelo’s and their vegetable sandwich. No sandwich holds a candle to this bad boy, which makes it so sucky they’ve been out of business for years. 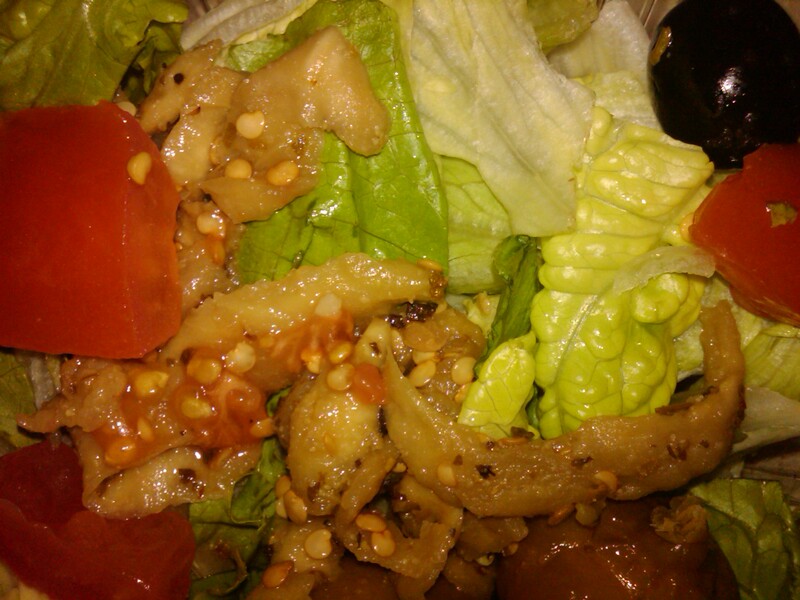 Add a little extra Italian dressing, and it’s a dripping heaven to your taste buds. If anyone knows their Italian dressing recipe (or hell, DeFazio’s or Sweet Basil’s), I’ll buy you dinner at DeFazio’s if you’ll share it! I want to go to DeFazio’s on the daily… That’s a bad thing, too. And my bro-in-law doesn’t like the eggplant. Weirdo. Just means more for my sister! And I agree, their catered (and buffet, I assume) food is still good. We’ve had the lasagna at work at least four or five times, and trust me I ate it every time. But it was nothing compared to the bite I had of Kaitlin’s. So I was just throwing that idea out there for anyone who’d had it catered/on the buffet. This is the most tempting article yet! I’m so hungry right now I can’t focus. So looking at these pictures is sheer torture. I NEED an Italian salad in my life. Hey, you have some free time at lunch. We should go sometime! Or dinner. Or breakfast. You know. Whatever. OK, they don’t serve breakfast. I had their lunch buffet and fell in love with the crispy golden goodness they call chicken wings!!!! the wings in and of themselves were hot and crispy but it was the sweet hot dipping sauce on the side that i found AMAZING. It’s been two days and i’m still in hot wing heaven. I GOTTA have the recipe, can be used for more than just wings. i’m thinking fish, pork, grilled chicken, shots maybe? Stopped at DeFazio’s Saturday night and fell in love w/their Italian Dressing. Even bought a pint to take home to SD. Can some one tell what the ingredients are in it? I’d love to have the recipe. That’s the dream, Marie. I spent one summer trying to replicate it. The closest I got was grinding garlic cloves with sea salt with a mortar and pestle. Then adding in various fresh (or dried) herbs. And then I used red pepper olive oil, but couldn’t ever figure out if I should use red wine vinegar or what. That was as close as I got. I also tried grinding in some red pepper flakes since it has a bit of a kick. Anyway, fail. When you find it, let me know!